Frank Brooks was born in 1860. He married Amanda Catherine Parker, daughter of Henry Parker and Mary Browning, before 1892 at second marriage for her. Name Variation Leonard Brooks was also known as Miller. Name Variation Leonard Brooks was also known as John Leneon. Leonard Brooks was born in 1892 at Kentucky. He was the son of Frank Brooks and Amanda Catherine Parker. Leonard Brooks died before 1976. [S244] U.S. Federal Census 1910 U.S. Federal Census, by Ancestry.com, Year: 1910; Census Place: Turner, Bell, Kentucky; Roll: T624_464; Page: 1A; Enumeration District: 0028; FHL microfilm: 1374477. Married Name 24 December 1910 As of 24 December 1910,her married name was Harris. Sudie Louella Brooks was born in 1894 at Kentucky also reported as 1895. She was the daughter of Frank Brooks and Amanda Catherine Parker. Sudie Louella Brooks married Jake Andrew Harris, son of William Frank Harris and Mary Jane Weddle, on 24 December 1910. Sudie Louella Brooks died in 1985. 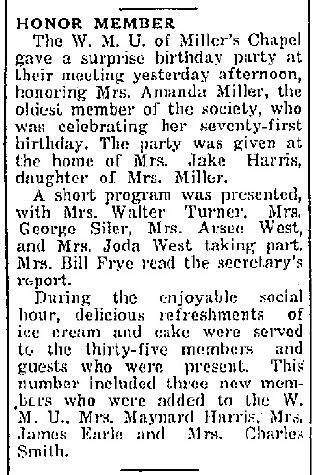 In 1934 71st Birthday party for Amanda Miller. [S373] U.S. Federal Census 1940 U.S. Federal Census, by Ancestry.com, Year: 1940; Census Place: Bell, Kentucky; Roll: T627_1280; Page: 2B; Enumeration District: 7-28. Name Variation James Miller Jr. was also known as Jimmy. James Miller Jr. was born circa 1882 at Bell, Kentucky. He was the son of Reverand James Miller. James Miller Jr. died before 1976. Name Variation Nancy Katherine Miller was also known as Nan. Name Variation Nancy Katherine Miller was also known as Nannie. Married Name circa 1900 As of circa 1900,her married name was Noe. Nancy Katherine Miller was born on 29 July 1882 at Knox, Kentucky. 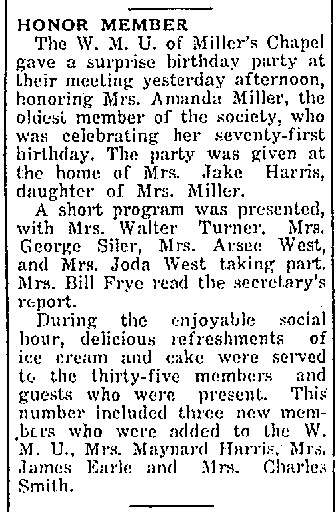 She was the daughter of Reverand James Miller. Nancy Katherine Miller married Rufus Patton Noe circa 1900. 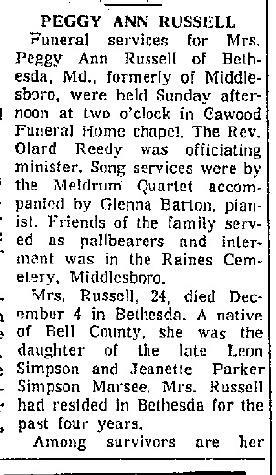 Nancy Katherine Miller died on 16 December 1977 at Knox, Kentucky, at age 95 Mrs. Nancy (Miller) Noe obituary. [S245] U.S. Federal Census 1900 U.S. Federal Census, by Ancestry.com, Year: 1900; Census Place: Opassom Hollow, Whitley, Kentucky; Roll: 555; Page: 2A; Enumeration District: 0139; FHL microfilm: 1240555. Name Variation Rufus Patton Noe was also known as R. P.
Rufus Patton Noe was born on 23 December 1879 at Lee, Virginia, also reported as Dec 1878. He married Nancy Katherine Miller, daughter of Reverand James Miller, circa 1900. Rufus Patton Noe died on 2 September 1974 at Harlan, Kentucky, at age 94 Rufus Patton Noe obituary. Name Variation Jake Andrew Harris was also known as Jacob Andrew. Name Variation Jake Andrew Harris was also known as Pap. Jake Andrew Harris was born on 19 August 1889 at Rose Hill, Lee, Virginia, also reported as 19 Aug 1890. He was the son of William Frank Harris and Mary Jane Weddle. Jake Andrew Harris married Sudie Louella Brooks, daughter of Frank Brooks and Amanda Catherine Parker, on 24 December 1910. Jake Andrew Harris died on 11 March 1963 at Bell, Kentucky, at age 73 Jake Harris obituary. Married Name Her married name was Russell. Peggy Ann Simpson married (?) Russell. Peggy Ann Simpson was born circa 1945. She was the daughter of James Leon Simpson. Peggy Ann Simpson died on 4 December 1969 Peggy Ann (Simpson) Russell obituary. (?) 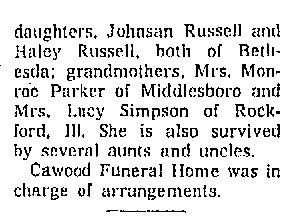 Russell married Peggy Ann Simpson, daughter of James Leon Simpson. Henry Harris was born circa 1925 at Kentucky. He was the son of Jake Andrew Harris and Sudie Louella Brooks. Henry Harris died before 1963. Floyd Curtis Harris was born on 16 October 1932 at Middlesboro, Bell, Kentucky. Floyd Curtis Harris married Delores Rebekah in 1955. Floyd Curtis Harris died on 14 October 2004 at age 71. Married Name 1955 As of 1955,her married name was Harris. Delores Rebekah married Floyd Curtis Harris, son of Jake Andrew Harris and Sudie Louella Brooks, in 1955. Name Variation William Frank Harris was also known as Frank. William Frank Harris was born in 1834 at Lee, Virginia, also reported as Ireland. He was the son of Thompson Harris and Susan Ingle. William Frank Harris married unknown (?) before 1868. William Frank Harris married Mary Jane Weddle, daughter of George Martin Weddle and Mary (? ), on 25 October 1879 at Lee, Virginia, also reported as 23 Oct 1879. William Frank Harris died before 1900. [S246] U.S. Federal Census 1880 U.S. Federal Census, by Ancestry.com, Year: 1880; Census Place: Lee, Virginia; Roll: 1375; Family History Film: 1255375; Page: 257B; Enumeration District: 045. Name Variation Mary Jane Weddle was also known as Waidel. Name Variation Mary Jane Weddle was also known as Waddle. Name Variation Mary Jane Weddle was also known as Maria Jane. Name Variation Mary Jane Weddle was also known as Jane. Married Name 25 October 1879 As of 25 October 1879,her married name was Harris. Mary Jane Weddle was born on 25 March 1856 at Lee, Virginia, also reported as Mar 1857. She was the daughter of George Martin Weddle and Mary (?). Mary Jane Weddle married William Frank Harris, son of Thompson Harris and Susan Ingle, on 25 October 1879 at Lee, Virginia, also reported as 23 Oct 1879. Mary Jane Weddle died on 15 December 1922 at Shelby, Kentucky, at age 66. Mary Jane Weddle had 11 with 10 living in 1900 children. She had 11 with 10 living in 1910 children. [S248] U.S. Federal Census 1860 U.S. Federal Census, by Ancestry.com, Year: 1860; Census Place: Western District, Lee, Virginia; Roll: M653_1357; Page: 773; Image: 349; Family History Library Film: 805357. [S245] U.S. Federal Census 1900 U.S. Federal Census, by Ancestry.com, Year: 1900; Census Place: Civil District 5, Claiborne, Tennessee; Roll: 1561; Page: 8A; Enumeration District: 0005; FHL microfilm: 1241561. [S244] U.S. Federal Census 1910 U.S. Federal Census, by Ancestry.com, Year: 1910; Census Place: White Shoals, Lee, Virginia; Roll: T624_1633; Page: 10A; Enumeration District: 0037; FHL microfilm: 1375646. [S243] U.S. Federal Census 1920 U.S. Federal Census, by Ancestry.com, Year: 1920; Census Place: Huntington Ward 4, Cabell, West Virginia; Roll: T625_1951; Page: 14A; Enumeration District: 27; Image: 63. Daniel Harris was the son of Jake Andrew Harris and Sudie Louella Brooks. William Harris was the son of Jake Andrew Harris and Sudie Louella Brooks. James Leroy Rose died before 1972. Name Variation Orlenia M. Harris was also known as Orlean. Name Variation Orlenia M. Harris was also known as Weddle maiden name of mother. Name Variation Orlenia M. Harris was also known as Arline. Name Variation Orlenia M. Harris was also known as Orlena. Name Variation Orlenia M. Harris was also known as Arleen. Name Variation Orlenia M. Harris was also known as Arlena. Married Name 31 December 1895 As of 31 December 1895,her married name was Fee. Married Name 10 February 1904 As of 10 February 1904,her married name was Woodward. Orlenia M. Harris was born on 8 May 1879 at Lee, Virginia, also reported as May 1878. She was the daughter of William Frank Harris and Mary Jane Weddle. Orlenia M. Harris married Granville Fee, son of Hiram Fee and Joyce Howard, on 31 December 1895 at Claiborne, Tennessee, listed as Arlenania Wadle. Orlenia M. Harris married William Martin Woodward, son of James Woodward and Mary Yeary, on 10 February 1904 at 2nd marriage for her; 1st for him, Lee, Virginia. Orlenia M. Harris died on 19 January 1938 at Ewing, Lee, Virginia, at age 58 also reported as 18 Jan 1938. Orlenia M. Harris had 3 with 1 living in 1900 children. [S244] U.S. Federal Census 1910 U.S. Federal Census, by Ancestry.com, Year: 1910; Census Place: Rose Hill, Lee, Virginia; Roll: T624_1633; Page: 1B; Enumeration District: 0035; FHL microfilm: 1375646. [S243] U.S. Federal Census 1920 U.S. Federal Census, by Ancestry.com, Year: 1920; Census Place: Rose Hill, Lee, Virginia; Roll: T625_1896; Page: 8B; Enumeration District: 49; Image: 360. [S250] U.S. Federal Census 1930 U.S. Federal Census, by Ancestry.com, Year: 1930; Census Place: Rose Hill, Lee, Virginia; Roll: 2449; Page: 11B; Enumeration District: 0012; Image: 406.0; FHL microfilm: 2342183. Granville Fee was born circa 1872 at Kentucky. He was the son of Hiram Fee and Joyce Howard. Granville Fee married Manervia Scott on 14 February 1890 at Harlan, Kentucky. Granville Fee married Orlenia M. Harris, daughter of William Frank Harris and Mary Jane Weddle, on 31 December 1895 at Claiborne, Tennessee, listed as Arlenania Wadle. Granville Fee died on 20 November 1899 at Walnut Hills, Virginia, shot by deputy sheriff Neal Jennings after a quarrel. Name Variation Mary Jane Fee was also known as Woodward surname of step-father. Name Variation Mary Jane Fee was also known as May. Married Name 22 November 1925 As of 22 November 1925,her married name was Rowlett. Mary Jane Fee was born on 27 October 1899 at Lee, Virginia. She was the daughter of Granville Fee and Orlenia M. Harris. Mary Jane Fee married Lawrence Rowlett on 22 November 1925 at Claiborne, Tennessee. 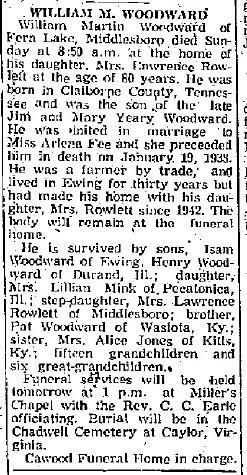 Mary Jane Fee witnessed the death of William Martin Woodward on 1 January 1956 at Bell, Kentucky; William Martin Woodward obituary. 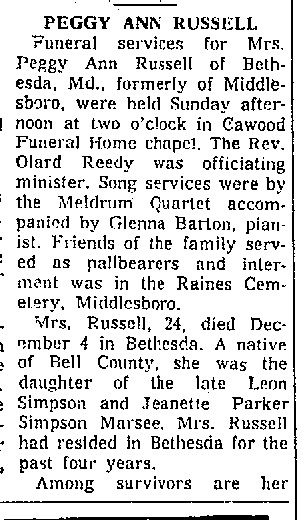 Mary Jane Fee died on 10 July 1966 at London, Kentucky, at age 66 Mary Jane (Fee) Rowlett obituary. Married Name 5 December 1901 As of 5 December 1901,her married name was Fugate. Susie Harris was born on 18 October 1883 at Keokee, Lee, Virginia, also reported as Oct 1882 and 18 Oct 1891. Susie Harris married Charles Fugate on 5 December 1901 at Lee, Virginia. Susie Harris died on 10 September 1952 at Norton, Wise, Virginia, at age 68. Maggie Harris was born in May 1892 at Virginia. Joseph Dagley Harris was born on 14 November 1893 at Hagen, Lee, Virginia, also reported as Nov 1894 and 14 Nov 1892; also reported as West Virginia. Joseph Dagley Harris died on 10 February 1952 at West Virginia at age 58. Name Variation William Martin Woodward was also known as Bill. Name Variation William Martin Woodward was also known as W. M.
William Martin Woodward was born on 27 July 1875 at Clairborne, Tennessee, also reported as 20 Jul 1879. He was the son of James Woodward and Mary Yeary. William Martin Woodward married Orlenia M. Harris, daughter of William Frank Harris and Mary Jane Weddle, on 10 February 1904 at 2nd marriage for her; 1st for him, Lee, Virginia. William Martin Woodward died on 1 January 1956 at Bell, Kentucky, at age 80 William Martin Woodward obituary. Name Variation William Isom Woodward was also known as Isam. Name Variation William Isom Woodward was also known as Isom. Name Variation William Isom Woodward was also known as William Isam. Name Variation William Isom Woodward was also known as Irvin. William Isom Woodward was born on 15 August 1911 at Kentucky. He was the son of William Martin Woodward and Orlenia M. Harris. 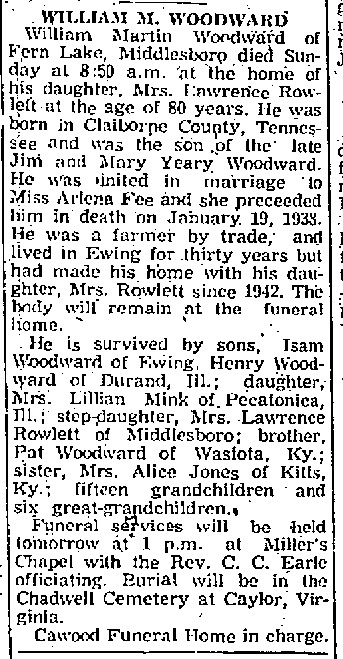 William Isom Woodward married Evelyn Moore, daughter of Robert Jefferson Moore and Bonnie L. Yeary, on 6 June 1956 at Clairborne, Tennessee. William Isom Woodward died on 5 June 1979 at Pinellas, Florida, at age 67. Married Name 15 April 1938 As of 15 April 1938,her married name was Mink. Lillian Della Woodward was born on 29 December 1918 at Wise, Virginia. She was the daughter of William Martin Woodward and Orlenia M. Harris. Lillian Della Woodward died in November 1992 at age 73. Lawrence Rowlett was born on 23 March 1892. He married Mary Jane Fee, daughter of Granville Fee and Orlenia M. Harris, on 22 November 1925 at Claiborne, Tennessee. Lawrence Rowlett died on 15 June 1974 at age 82. Married Name before 1868 As of before 1868,her married name was Harris. Unknown (?) married William Frank Harris, son of Thompson Harris and Susan Ingle, before 1868. Unknown (?) died before 1879. L. D. Harris was born circa 1868 at Tennessee. He was the son of William Frank Harris and unknown (?). Married Name Her married name was Early. Nancy Isabelle Harris married Ewing Early. Nancy Isabelle Harris was born on 24 December 1880 at Lee, Virginia. Nancy Isabelle Harris died on 19 August 1937 at Shelby, Kentucky, at age 56.